It is with a mixture of pride and sadness that we are announcing that after three great years of art, herbalism, community-building, collaborations, vernissages, workshops, special events and fun… we are moving on. So very much happened in three years! 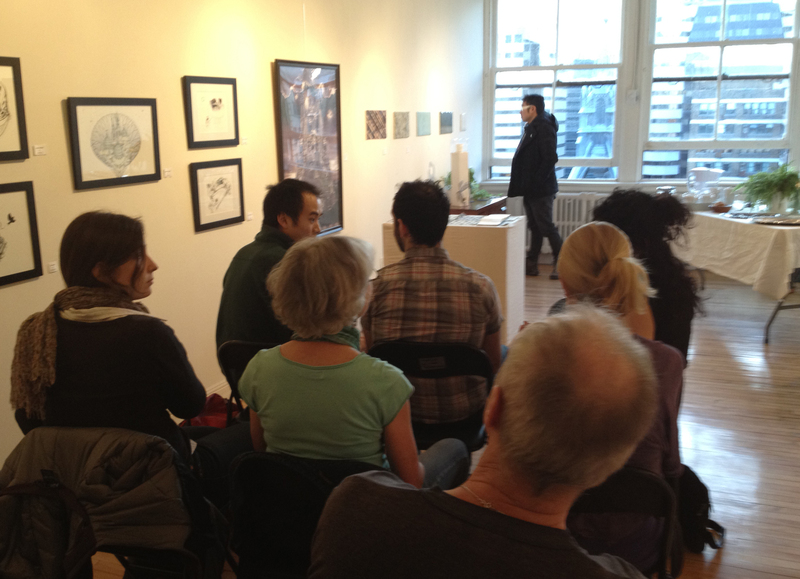 Special events in Fleurbain included artist presentations, poetry readings, and yoga and dance classes. 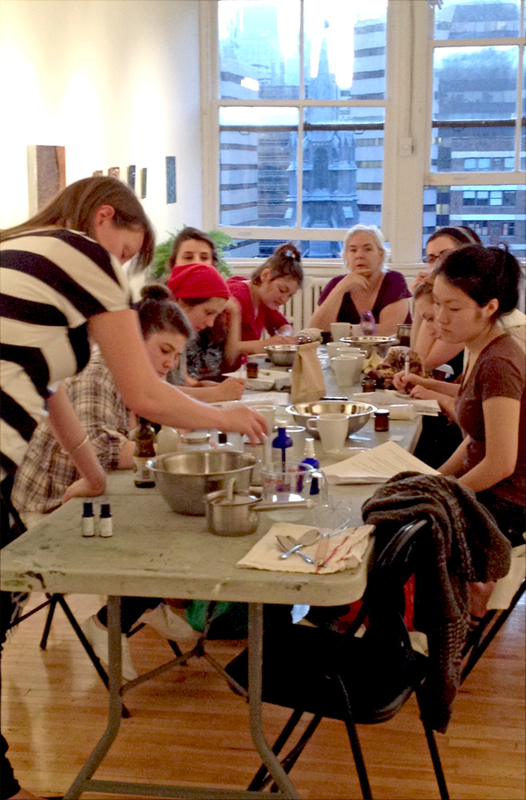 Workshops in herbalism, crafting, felt-making, painting, cosmetic creation, and health were always well-received. We had a lot (a LOT) of fun putting on these productions and we wouldn’t have done anything differently. 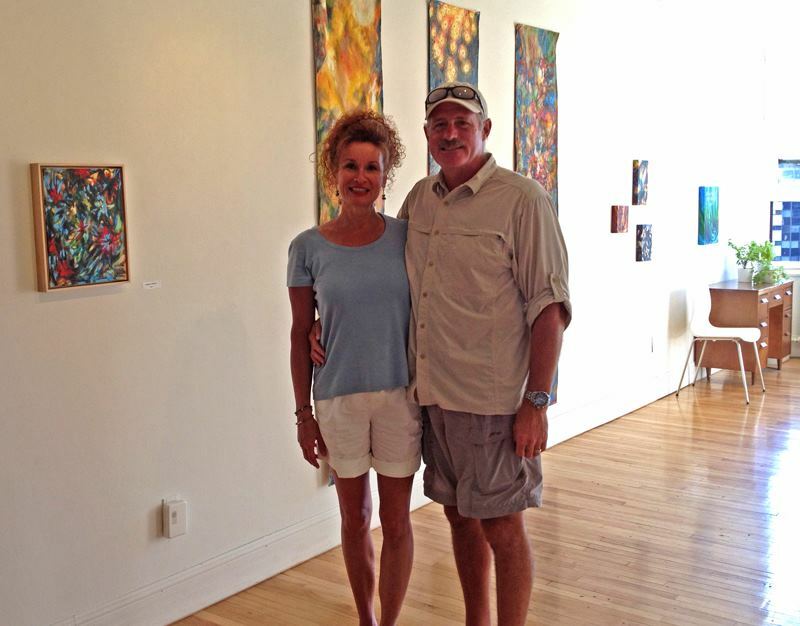 Our dear friend Cindi and her husband Bob came all the way from Michigan for a visit. Posing with Darlene St. Georges during her beautiful vernissage. People were the most important part of our experience. Thank-you to all who came to the events!!! 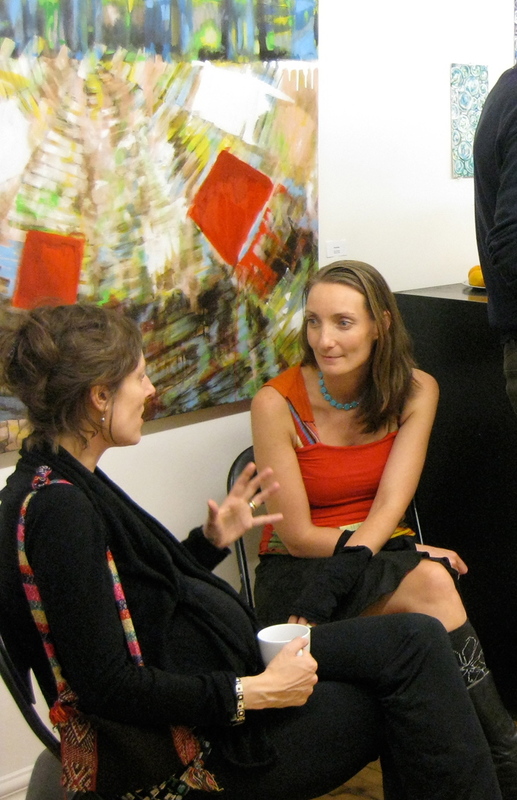 Popular vernissages were a chance to not only see some artworks and enjoy some treats, but provided an opportunity for attendees to meet new friends, and to connect with other artistic folks. This was one of the most valuable benefits of maintaining a physical space, so we hope to see all of you again in the near future around town! Do connect with Tammy on Facebook, and Natasha too. 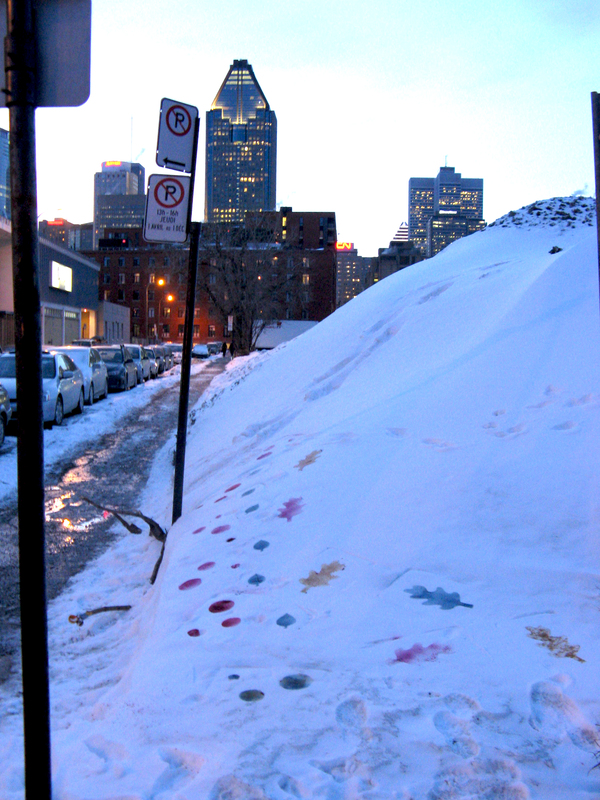 The impermanence of plant pigments on snow contrast well with the bright lights of an electric city. 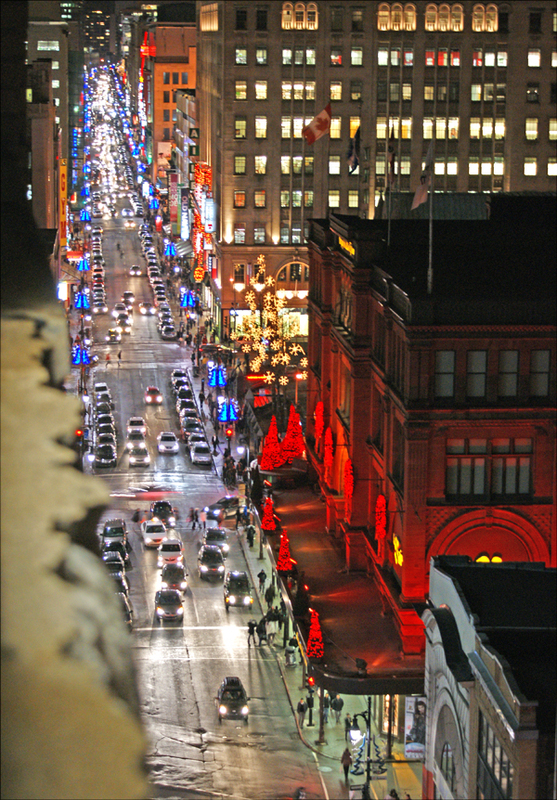 From Nuit Blanche the year before we moved into the downtown space. Abundance by Lorraine Miller Emmrys. What are we doing now? Tammy is booking private consultations and making tea and natural products for all your herbalist-needs in her new space in downtown Montreal. Contact her for more details or if you want to be added to her mailing list. Her email is tammy.schmidt.herbalist (at) gmail (dot) com. 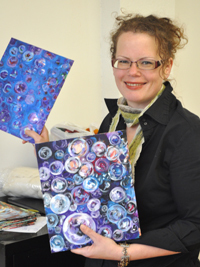 Natasha is happily selling her work online, and through ArtBomb. Please email her (NatashaHendersonArt(at) gmail (dot) com) if you would like to be added to her mailing list for upcoming exhibitions. Thank you everyone for all you have done, for your support, and your friendship. Looking forward to hearing from you soon! Natasha Henderson and Tammy Schmidt. Bye for now. Hope to see you soon! Fleurbain is located at 460 St Catherine West, Montreal. Our unit # is 917. We are directly across the street from St James United Church. Showtimes Sundays 9:30-2, or by appointment. Small Works Again, our annual small works show, opened last night to the tune of a very fun Pie Party. 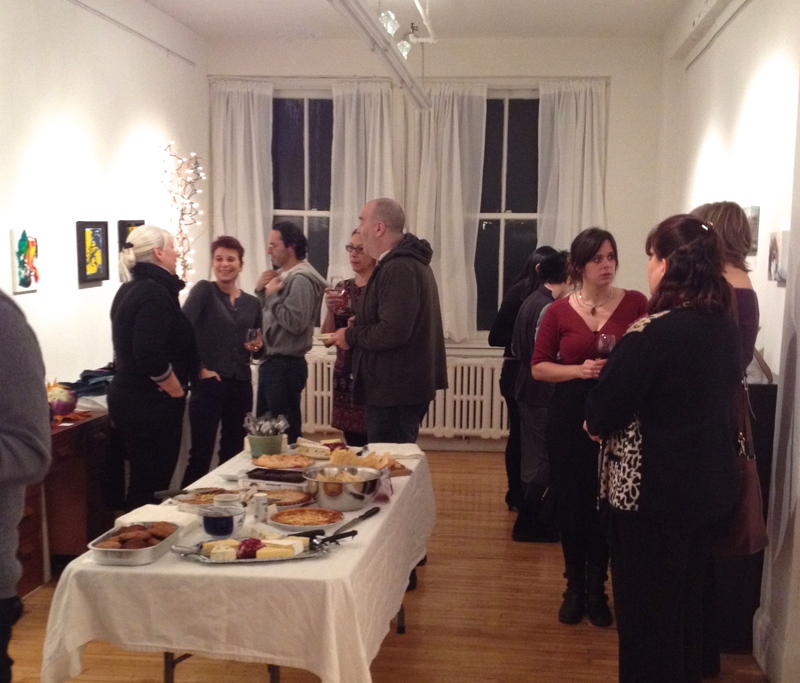 Guests and friends and participating artists enjoyed a potluck Pie fest alongside a wine and cheese. 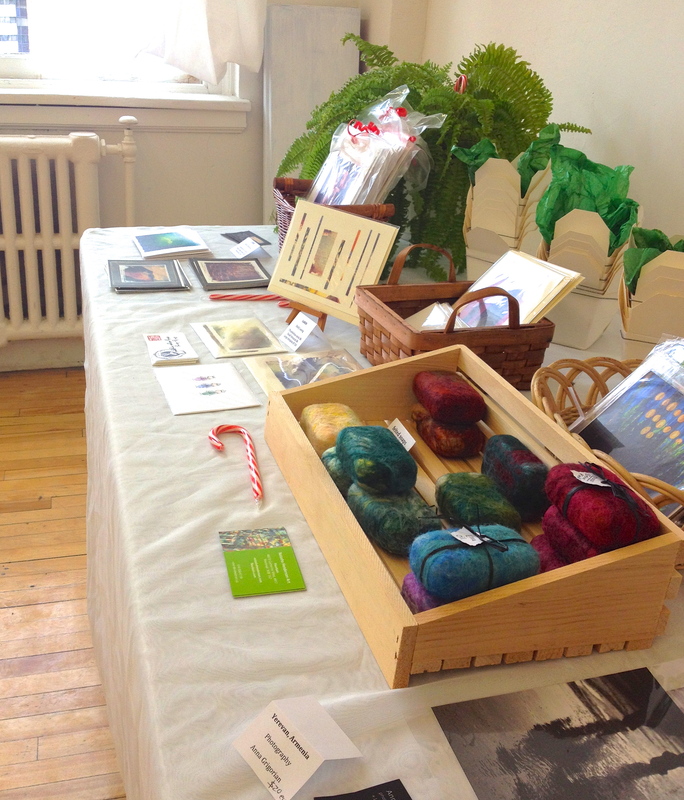 For the first time, we have featured a small craft/card table for participating artists to share some of their smaller small works. Participating artists are: Anna Grigorian, Donna McGee, Elissa Baltzer, Emily Leong, Nadia Mytnik-Frantova, Natasha Henderson, Sarah Robinson, and Thaneah Krohn. 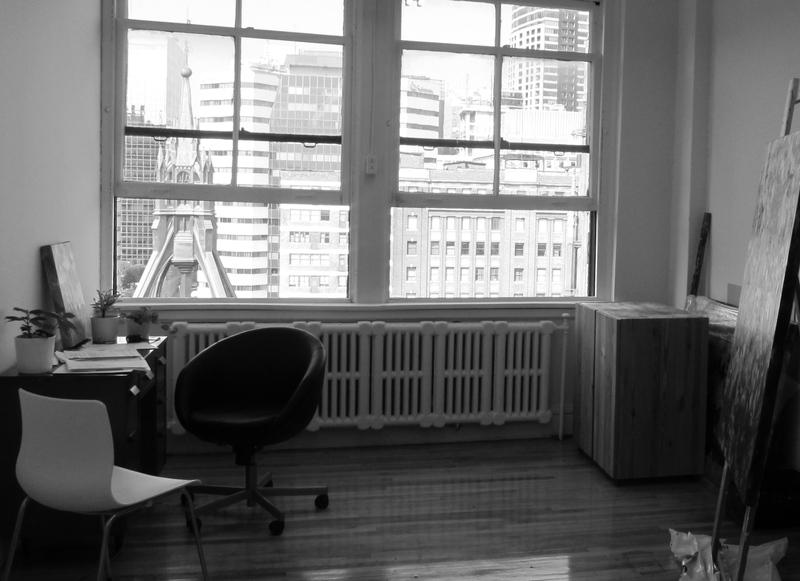 All work may be purchased on the spot, or can be reserved with a 50% deposit. Visit us and the show each Saturday and Sunday until mid-January from 11am-3pm, with extended hours too (TBA). See our Facebook page for updates! 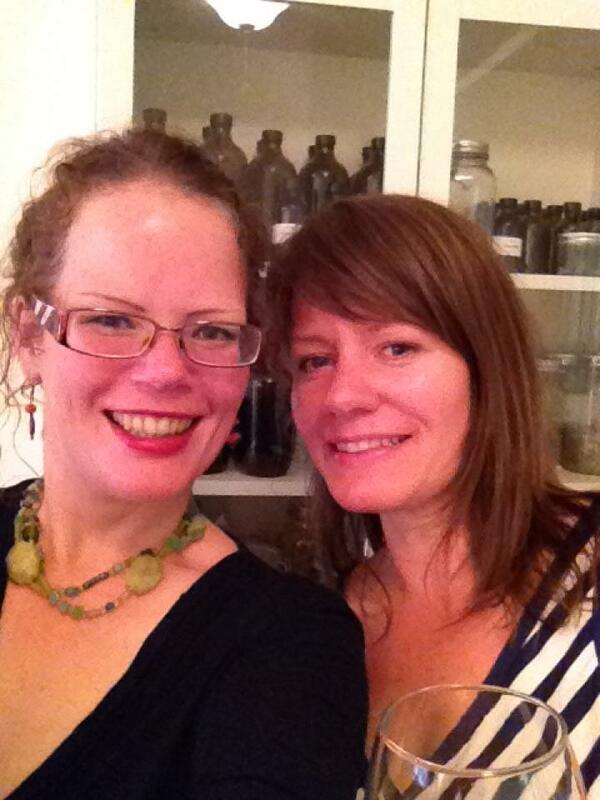 Our in-house herbalist, Tammy Schmidt, presented us with a delicious nutritive tea. 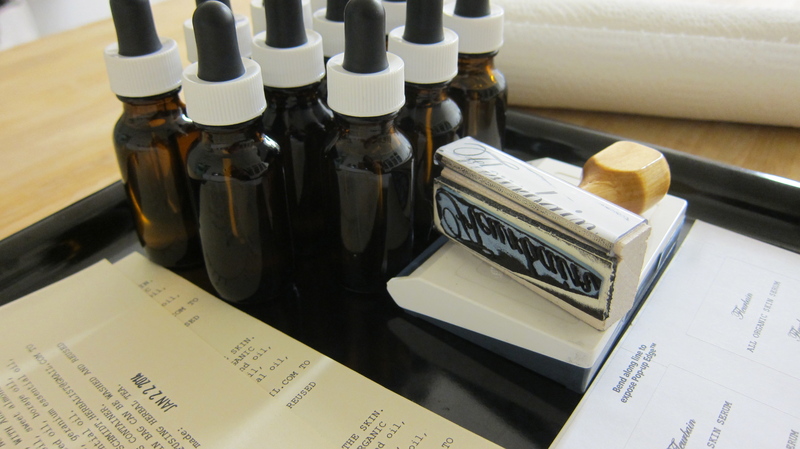 She had some of her luscious skin serum available, as well as tasty lip balm, Vanilla Maple seasoning, and her infamous teas. Come by to see what other fresh herbal concoctions are a-brewin’. 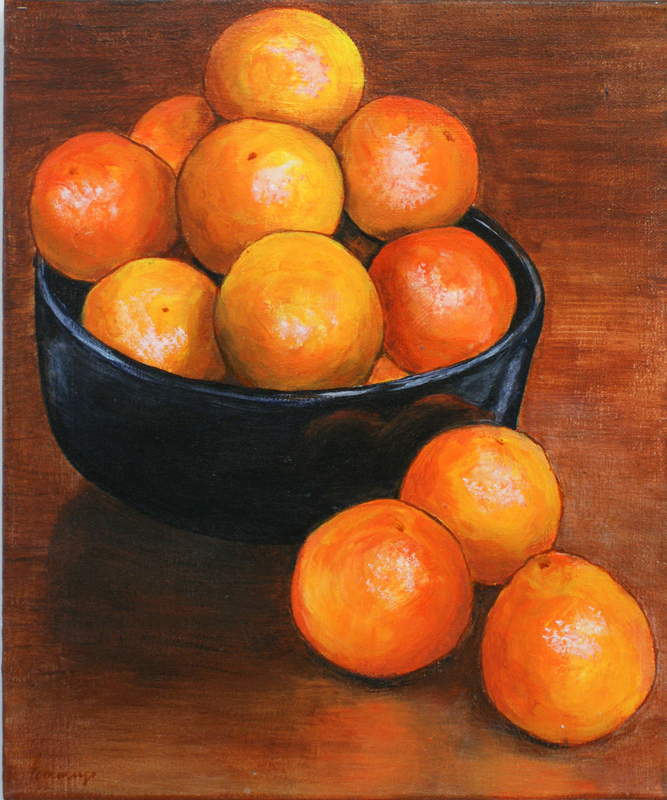 An online gallery of the small works is available, works can be viewed and purchased here. 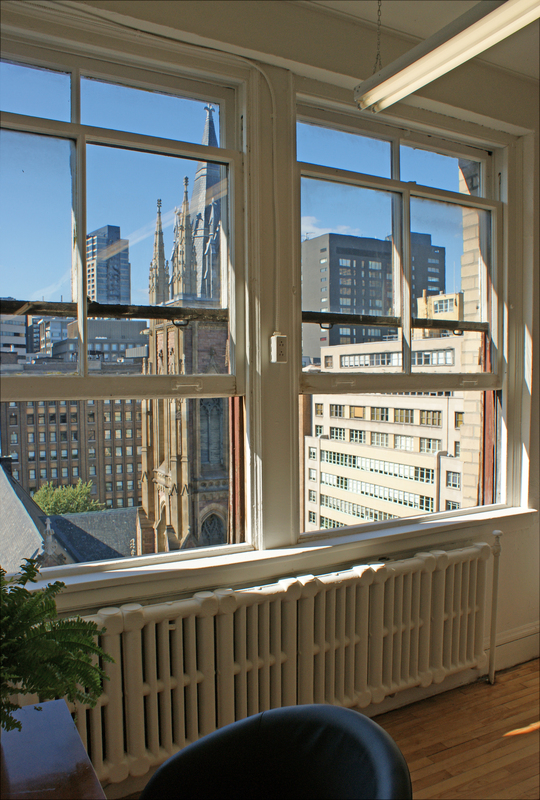 Fleurbain is located in the heart of downtown Montreal, across the street from the picturesque St James United Church. 260 St Catherine Street West, Unit 917. Always ready for appointments, at most any time. Just email us at fleurbain(at)gmail(dot)com and we’ll get the tea on for you! What to do? Fall is falling upon us, and we sit at home and make or eat pies. Or, at least we want to. However, before the leaves and then the snow flies, it would be good to get in a few dashes of culture, networking, and enrichingly fun times. Saturday September 28, from 6pm-9pm we are hosting a vernissage to celebrate our participation in Culture Days / Journées de la culture. 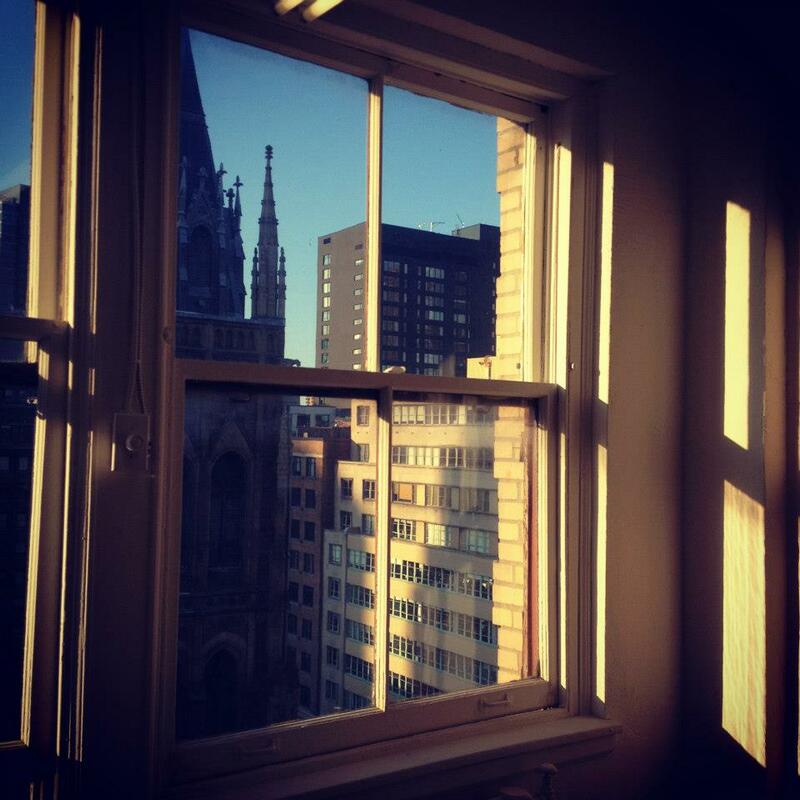 See our exhibition Vue par la fenêtre – Through The Window. Eight Montreal artists have been asked to ponder what they see from our ninth-storey view of downtown Montreal. The results are beautiful, a little bit haunting, and brightly talented. 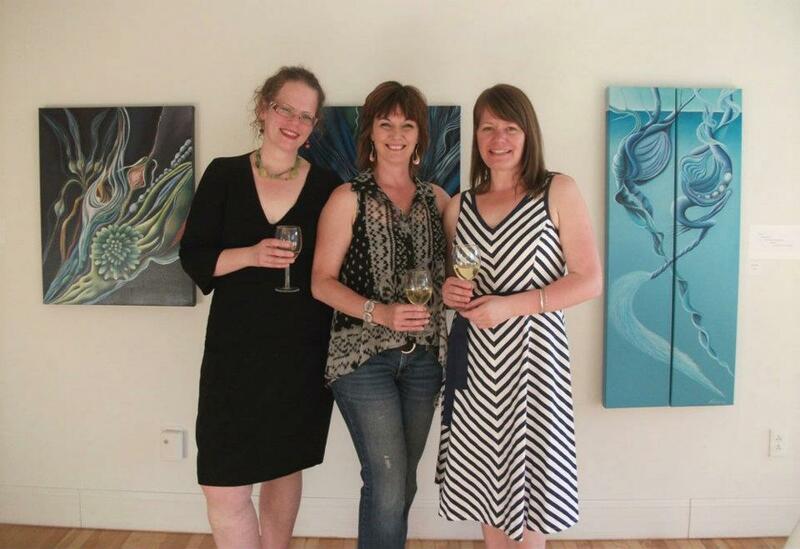 Visit with most of the artists, have a glass of wine, and see the (night-time) view for yourself! Artists participating are Elissa Baltzer, Jose Duclos, Anna Grigorian, HasmiG, Natasha Henderson, Donna McGee, Sarah Robinson, and Susan Shulman. Then join us Saturday October 5, from 7:30pm for readings by Montreal-based poets and writers. Kelly Drukker, Jeffrey Mackie, Nick Tan, Nicolas Papaxanthos, Meredith Darling, and Christine Miscione will grace our “stage” for Through The WIndow – Readings. See the exhibition at the same time, see the night-time view from our window, and meet with new or old friends. Guaranteed good times, unless you really require a chair… Seating is limited, but we promise the floor will be spotless. Feel free to bring a cushion! Upcoming fun this autumn… We are very excited to announce that we will be part of the official programming for Culture Days / Journées de la culture, September 27-29, 2013. 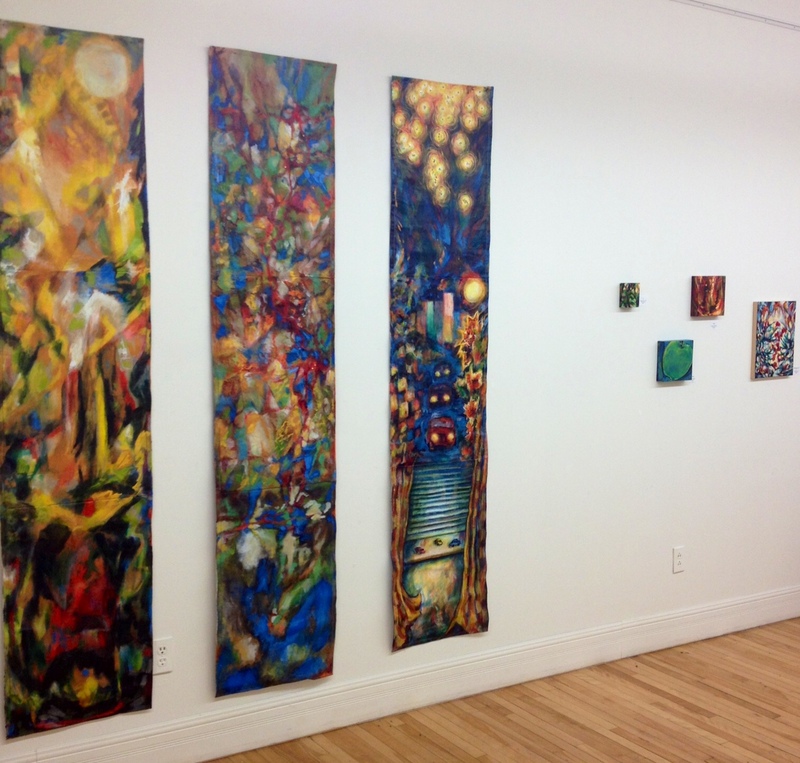 Photography, painting, and mixed media artists are collaborating to reflect upon the unique 9th storey, Fleurbain view of downtown Montreal. The work in this group exhibition reflects the experience of looking out… as we look out, we look in. List of artists to be announced mid-September… Stay tuned! While visiting during daytime hours, as a part of Culture Days, we are offering a chance for you to make your own piece of artwork that is inspired by our view. The following Saturday (October 5) we will be hosting a poetry reading in collaboration with this exhibition. Stay tuned for that, too! 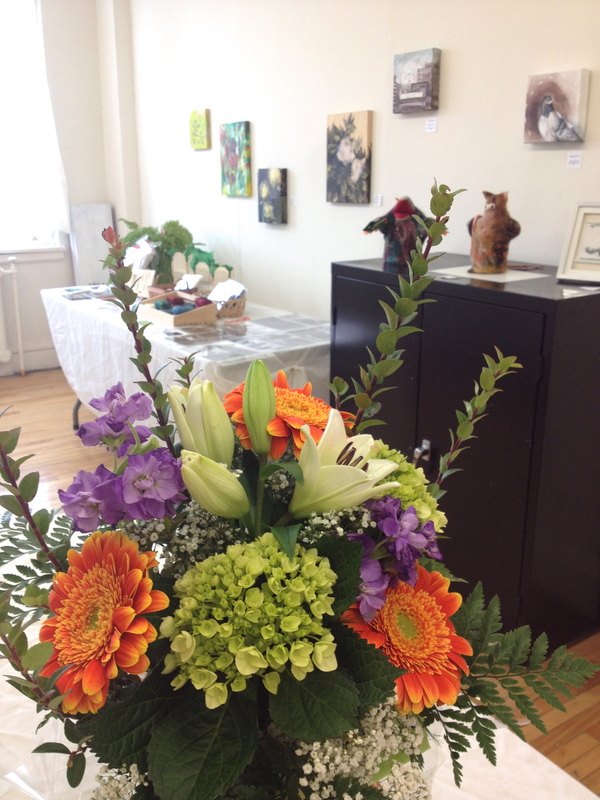 Fleurbain is located at 460 St Catherine West, unit 917. This Saturday March 2, join us for Herbes Dix/Ten Plants during Montreal’s Nuit Blanche. We are excited to have been selected to be a part of the official programming of Nuit Blanche. 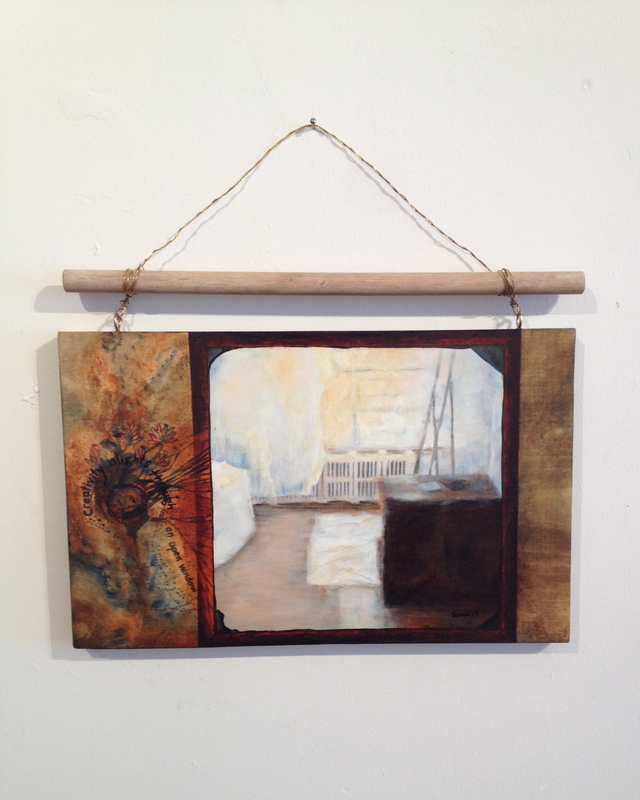 The exhibition features mixed media paintings on wood by Natasha Henderson. The paintings depict ten plants that help you survive and thrive through the winter, as selected by Herbalist Tammy Schmidt. We will open early, at 6pm, to accomodate more people throughout the evening. We recommend coming early (before 8pm) in order to enter our free draw for a painting from the show. We will also offer special discount coupons to everyone who drops by, as well as entice you to play a fun and competitive game “Match The Latin!” So come by before 8pm if you can. See you! 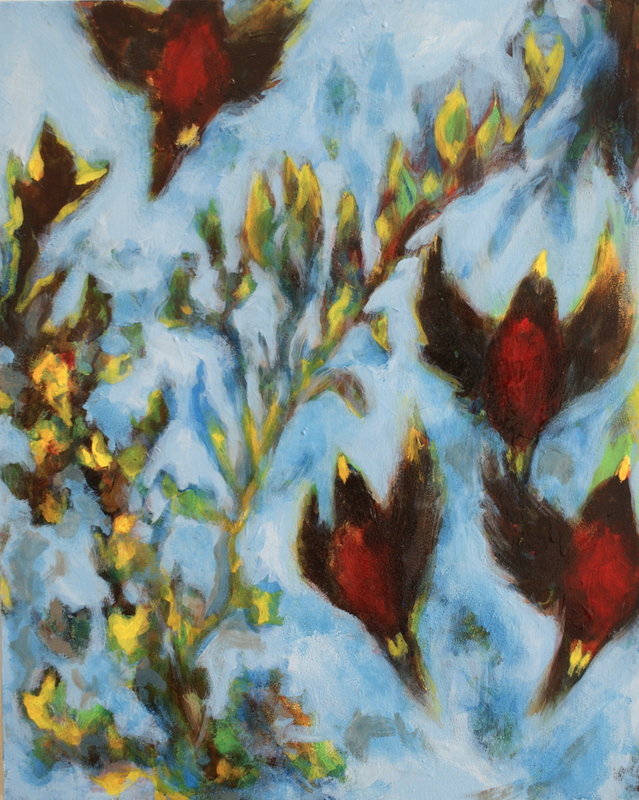 In the gallery space Fleurbain through January and February is a changing selection of painting, feltworks, and craft by artist and curator Natasha Henderson. Works will be available to view through the end of February, when an exciting new interactive project will be unveiled for Nuit Blanche in Montreal! 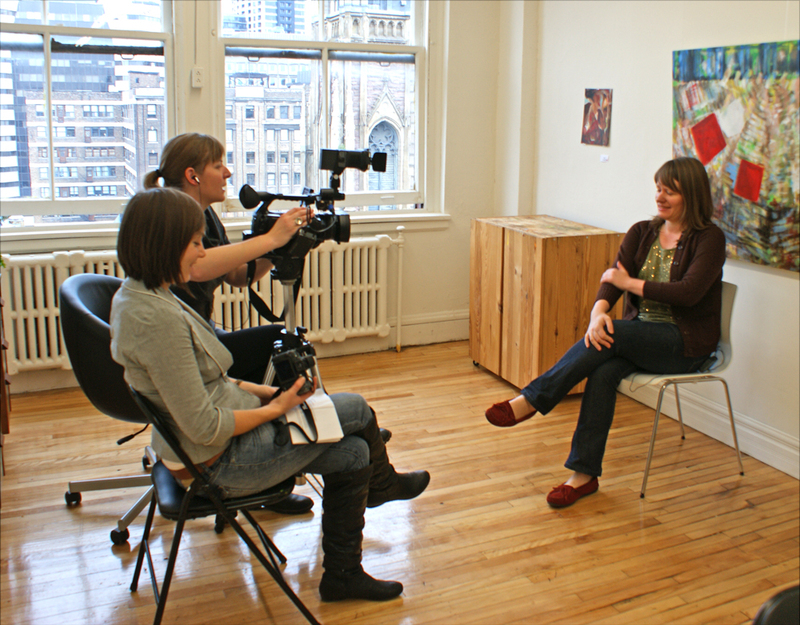 Natasha will host gallery hours Tuesday-Thursday 3pm-6pm, as well as other days by appointment. 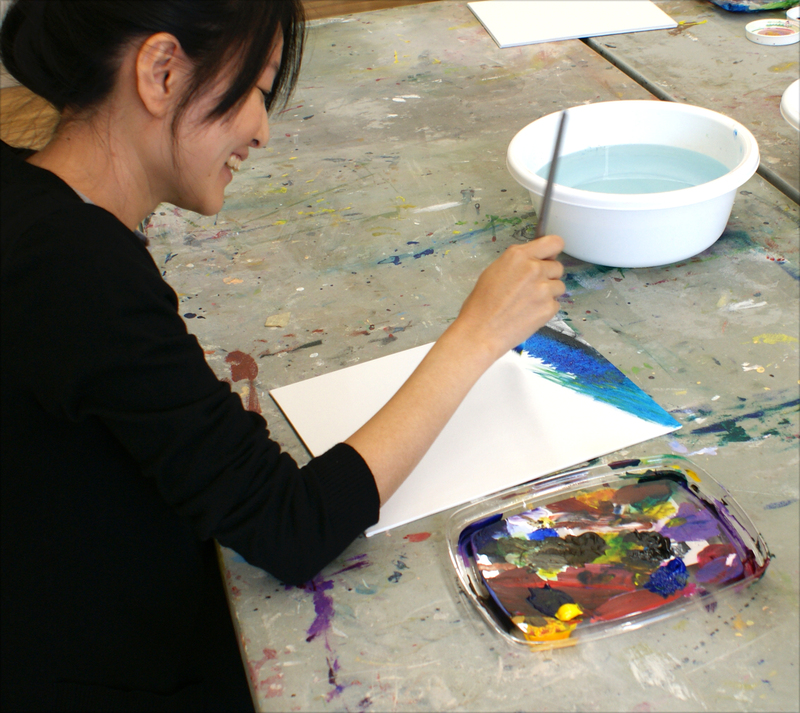 Besides visiting to see the artworks in Fleurbain and chatting with our resident artist-curator, you can opt to participate in workshops in painting and feltmaking. 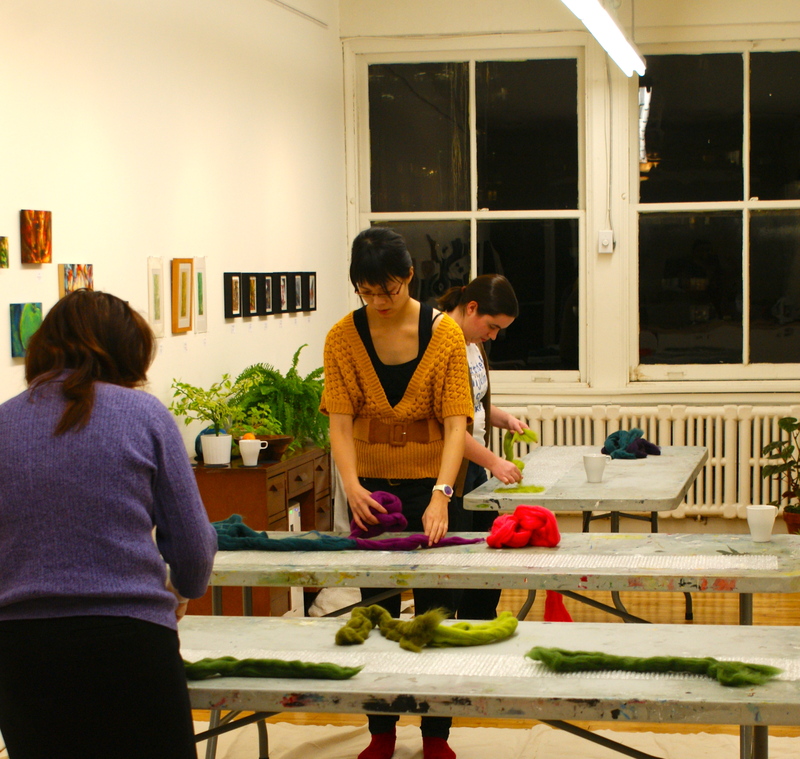 On Wednesday January 30 join us from 7-9pm to make your own merino felt wool scarf. You will learn the process of wet-felt making, and create your own colourful and soft, beautiful scarf to take home at the end of the night. Register by email: Fleurbain@gmail.com Cost is only $50, everything included. Another upcoming workshop (or, rather, a series of them) is Second Sunday. 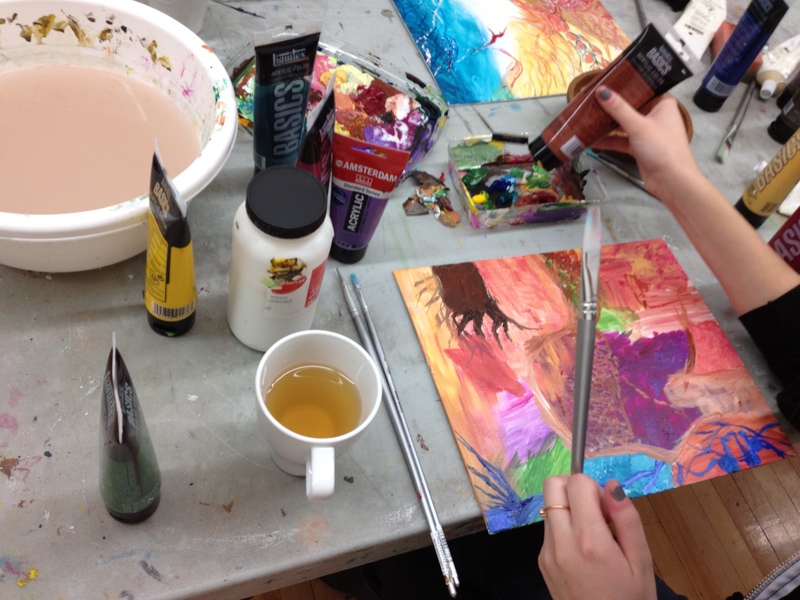 Drop in to paint the Second Sunday of each month. Our first session is February 10, from 1pm-3pm. $40 for everything, all materials, encouragement, and a nice cuppa tea. Brush up on your existing skills, problem-solve, relax, and get creative. All levels of experience are welcome. Email Fleurbain@gmail.com for more details or to reserve a spot (drop-ins are always welcome, but class size is limited to eight students.) Note in May, the class is bumped to the third Sunday, to accommodate Mother’s Day. Hope to see you soon in Fleurbain. 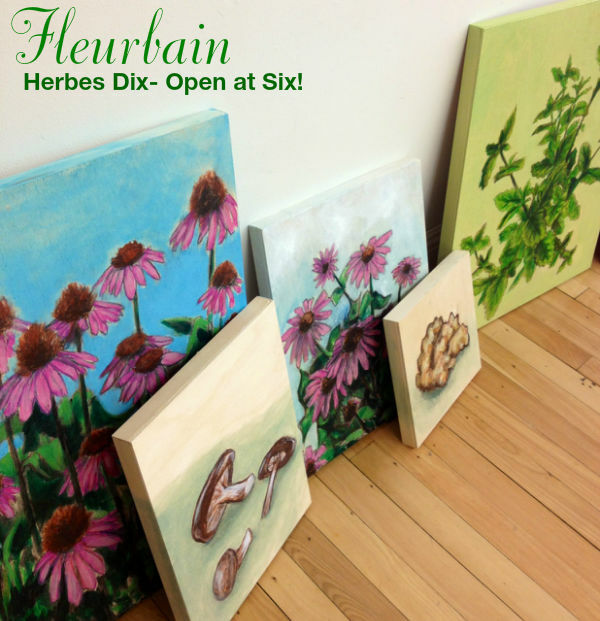 Fleurbain is located at 460 St Catherine West, Unit 917. 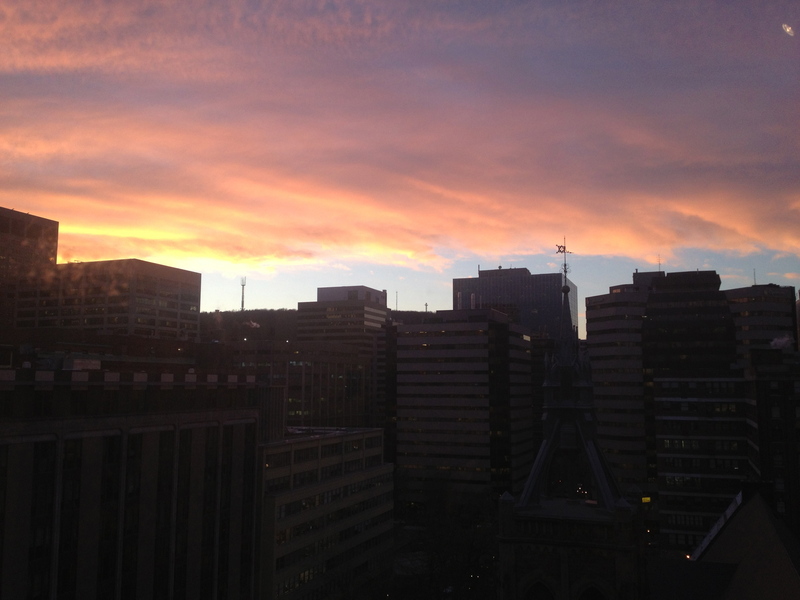 We have a stunning view of St James United Church, and the city of Montreal.